We recently got in some packages from the fine folks at Daedalus and were thrilled to open them up. I’ve been checking out their products for a long time and this was the first one I’d ever been able to see in person. I’ve had inserts from Folded Space and Broken Token and these ones measure up nicely, so far. I was impressed immediately by the quality of the components and the ebony finish is super cool. My main issue is that it doesn’t come with printed instructions and you have to watch a YouTube video on how to install it. And while the video is nice, having a printed option would have been helpful if that wasn’t my thing. Regardless, it was relatively simple to put together — I recommend doing wood glue with a little super glue to hold things in place while your wood glue dries, for a faster experience. 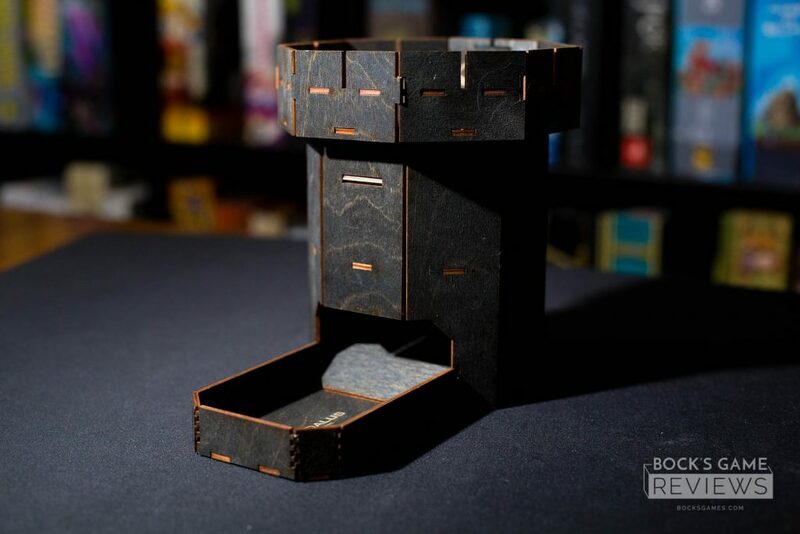 Despite how tall it is, the footprint is relatively small, around the size of a small box game which gave us plenty of room to use and play with at my D&D night. The catcher does a good job stopping the dice, too. Our main complaint was that it’s very loud — especially with metal dice. However, if I were to do things over again, I’d simply install some craft foam or felt on each layer to deaden the sound. It’d be pretty simple to do. My other complaint is that it’s not the easiest to take to game night with as large as it is. So I’d love to see them make one that’s collapsable or a “mini” version of this. I’m beyond happy with how this thing turned out and cannot wait to check out more of their products. We’ll be doing a review of their Clank! in! Space! insert very soon! So be sure to look for it.